The analysis of seismic signals obtained from near-source triaxial accelerometer recordings of two sets of single-block rockfall experiments is presented. The tests were carried out under controlled conditions in two quarries in northeastern Spain; in the first test (Foj limestone quarry, Barcelona), 30 blocks were released with masses ranging between 475 and 11,480 kg. The second test (Ponderosa andesite quarry, Tarragona) consisted of the release of 44 blocks with masses from 466 to 13,581 kg. An accelerometer and three high-speed video cameras were deployed, so that the trajectories, velocities, and block fragmentation could be tracked precisely. These data were used to explore the relationship between seismic energy and rockfall kinetics (the latter obtained from video analysis). We determined absolute and relative values of seismic energy and used them to estimate rockfall volumes. Finally, the seismic signature of block fragmentation was assessed in both the frequency and time domains. The ratios of seismic energy after impact to kinetic energy before impact ranged between 10-7 and 10-4. These variables were weakly correlated. The use of seismic energy relative to impacting kinetic energy was preferred for the estimation of volumes. Block fragmentation impacts were dominated by higher acceleration spectrum centroid frequencies than those of nonfragmentation impacts: 56.62 ± 2.88 and 48.46 ± 4.39 Hz at Foj and 52.84 ± 12.73 and 38.14 ± 4.73 Hz at Ponderosa. 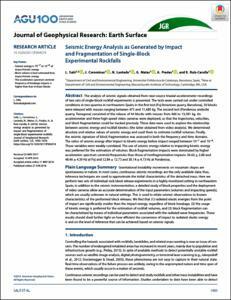 Saló, L., Corominas, J., Lantada, N., Matas, G., Prades, A., Ruiz, R. Seismic energy analysis as generated by impact and fragmentation of single-block experimental rockfalls. "Journal of Geophysical Research: Earth Surface", Juny 2018, vol. 123, núm. 6, p. 1450-1478.